Play this Great NEW Game and find out! What is this new game... Who's the Skipper? OFFSHORE Magazine says it best! 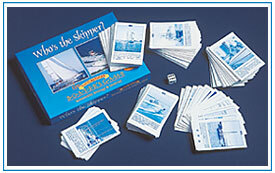 Developed for Both Power and Sailboaters... "Who's The Skipper" is mobile fun for boaters of all ages ... unique game design combines luck, strategy and boating knowledge enabling novice to compete with even the most experienced avid seaman. 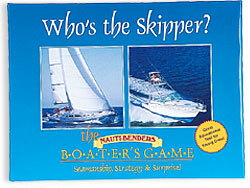 A Boater's Game... built on 500 basic to in-depth "Nauti-Bender" questions, designed to determine Who's The Skipper! Boat handling... docking... navigation... these are just some of the seamanship topics waiting to challenge you. Plus, keep a sharp lookout for those beguiling "Murphy Cards" that will have everyone in "knots"... and may turn even the saltiest "Captain" into a galley slave! Whether you're in the cockpit, dockside or by the fireplace... whether you're a novice, intermediate or experienced yachtsman... or whether it's a boating day or not... you can be at the helm with Who's The Skipper, an enjoyable and fun way to learn (or reinforce) your sailing and seamanship skills! Who's The Skipper has a compact design (7" x 9" x 1 1/2") that lets you stow it on board and a rugged construction to keep it safe in a squall. Full-color packaging makes it a great gift for your favorite power or sailboater! Want to Try Some Sample Questions?